I was invited to audit a short pastry class at Kitchen Conservatory a few weeks ago, and since then, I've been wanting to give my pastry making skill a try. "Cold dough + hot oven = flaky pastry" said Anne, as the chef/owner/instructor's words ran in my head for days. One of the recipes we made is Caramelized Tomato Tart and the savory tart left an indelible print in my taste buds. The vinegar in the recipe reminded me of a vegetable stew that is an iconic dish in any Filipino home. The veggie dish is called pinakbet. Later that week, a cousin of mine, Erick, shared a pic of Pinakbet Pizza. And this picture plus the pastry making class gave me an A-HA moment. 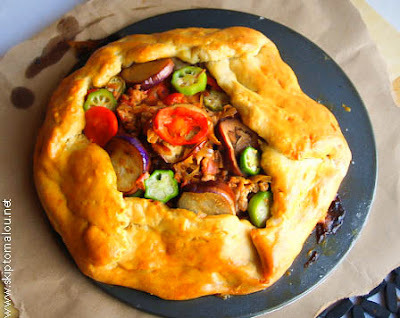 I want to make a Pinakbet Galette, came the idea. 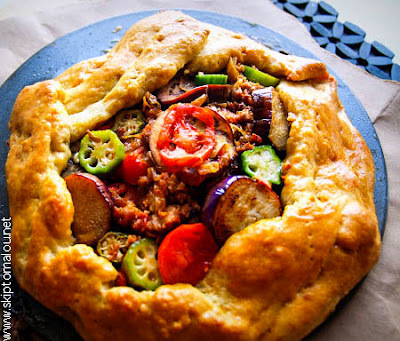 I played with the flavors of the traditional pinakbet and used it as a filling for a galette. I selected to make a galette because it's not as intimidating as making a beautiful, but dangerous to make (as in easy to fail), savory pie. I blame Martha Stewart for making picture perfect pies, now I'm afraid to even try! But making galettes is fun... as it is more forgiving. It gives you a free hand on how to form your crust. Pinakbet Galette may sound novel, or even bizarre to some. But before you raise those eyebrows, why not give it a try. Taste it and tell me how you like or dislike it. We'll have fun... trying something new.. and make our own take on combining an iconic Filipino vegetable dish with some pastry goodness. Pre-heat oven for 350 degrees. Mix together the flour, sugar and salt. Add the butter cubes and mix it together. Add in the eggs and form a ball. Pour a little water if the dough is not holding together. (note: water should be ice cold and pour just a little like a spoonful) Refrigerate for at least 30 minutes. In a saute pan, pour olive oil, butter, onions (put them altogether to avoid burning. The onions and garlic will be cooking while the butter is being melted). Cook for about 5 minutes until the onions become translucent. Add tomatoes. Cook for about 5 minutes or until the tomatoes become mushy. Add shrimp paste and vinegar. Add pork and cook for 10 minutes, stirring continuously to avoid burning. Add olive oil if necessary. Set aside. Slice all veggies and drizzle olive oil. Roll out the dough in a slightly flour coated surface. Form a 12 inch diameter circle. Slowly lift it up and put it on a baking sheet. Spread half of the filling onto the bottom layer. Layer it with all the veggies. Add the remaining filling and layer the remaining veggies. Fold the dough around the filling. Coat the outer layer with egg wash. Bake for about 30 minutes or until the dough turns golden brown. Remove from the oven and let it cool. Malou, I was too sleepy to read but your galette (but please, I don't know how to enunciate the word)is a stroke of genius. You are a great chef. This one is for the books. Thank you Ana Marie. I hope you could get back to sleep na haha. Happy Weekend! I love this veggie recipe, idea! 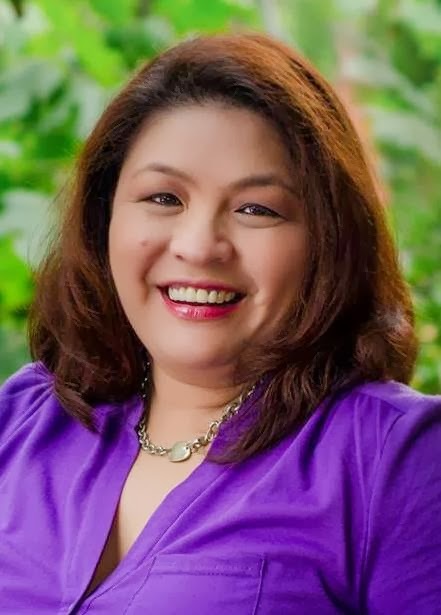 You are so creative with fresh new ideas, Malou! What an inspiration to the rest of us! Thanks for sharing generously your recipes. Do you mind if I try this, too? It might end up again in the "Skip to Malou" files of my blog posts! Happy Fri.! of course you may... that's what recipes are for.. to be shared! thank you for the blog love Betty Ann. Happy weekend. I'm so happy to have you around. haha you are hilarious. But don't get intimidated it's not that hard. Isn't the Kitchen Conservatory such great fun? Believe it or not, I have never made a galette. I also prefer savory pastry to sweet, so I'm going to give your recipe a try. It looks amazing. Yep I love Kitchen Conservatory. I love a lot of stuff there too. haha. Thanks Pattie for dropping by. I've had this dish before, but never knew it was called a pinakbet galette. Great recipe. One of these days I need to make it to Kitchen Conservatory - I live only a few miles from it and pass by it all the time. Silly that I've never been there. Oh what a great fusion dish! I love pinakbet but I always eat it the more traditional way. My Ni's birthday is coming up - this could be an excellent surprise for her. Well, from this pic, who won't like the taste of pinakbet from now on? The blend of colors adds to the .ganacity' this food offers notwithstanding the great taste of that old pinakbet! Indeed, a new twist! Worth a try! Thanks cuz! this looks wonderful & i hope to try this recipe soon, Malou! how many does this serve though? i cook small - for three - but all adults with good appetites ;-) is this enough or should i double it? this looks so delicious & i want to make it soon! what is the serving size for this recipe though? i cook small - for three with healthy appetites so really four :p would i need to double this or ...? Thanks for the comment. This recipe is good for 4. Actually it will give you two pieces of galettes that would be good for 4.
thanks for the question and I hope it helps. I hope you could share your photos with me or on my Facebook page. Thank you!